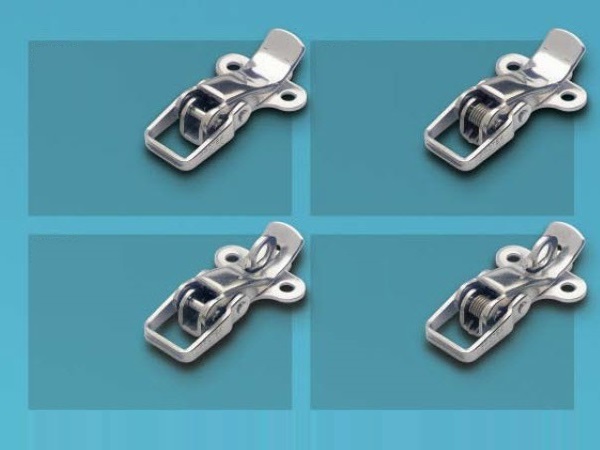 Consisting of two plates and a strap, this type of latch is very versatile and can be used in a variety of household and office products such as suitcases and briefcases, trunks, tool and jewelry boxes. 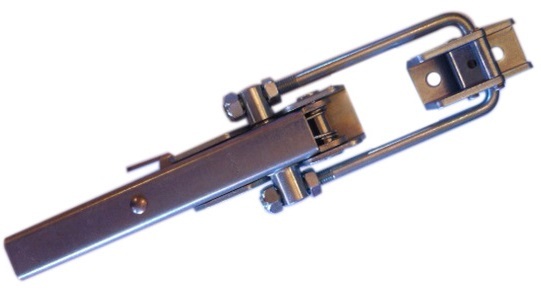 Draw Latches – Hardware Mfg. Draw latches are mechanical components used to join two adjacent objects or surfaces for the purposes of providing a secure and immobile closure, and commonly include door latches, gate latches and more. There are many different types of draw latches that are chosen by manufacturers according to their intended applications. Larger scale draw latches are found in more industrial settings such as enclosures or fastening trailer panels and windows. Smaller draw latches may be used for compartments or storage units which do require as much strength. The many uses of draw latches necessitate a variety of manufacturing materials and they are commonly made of stainless steel, plastic, or rubber. Stainless steel latches offer high strength and corrosion resistance, and are able to withstand a great amount of wear and tear. They are an ideal choice for many heavy duty applications and especially those used in marine and outdoor industries. While stainless steel latches provide extra security, rubber and plastic latches are best used when some flexibility is useful in fastening the two surfaces such as in shock absorption or mobile parts. The flexibility of plastic or rubber also allows for draw latches to be fit to corners and on hinges of components. Each draw latch, regardless of materials used consists of the same basic components and design and each has two plates and one strap. Each panel or component to be fastened by the draw latch has one of the plates attached to it. The strap is then permanently attached to one of these plates. This strap is the interconnecting element between the two plates and parts. It fits securely into the adjacent panel, most often inserting into a clip or groove to secure the two panels together. If the strap is made of steel it flips into place while a plastic or rubber strap is simply stretched until secure. The tension in either type of strap is the factor that holds the two panels together and prevents their opening. The draw latch is easily disengaged by unhooking the strap from the clip or groove, and allowing the strap to return to its panel. The manufacturing process of draw latches varies depending on the materials used, but often involves stamping, molding, or both. The components are later assembled into the finished pieces to be attached to the necessary panels. Draw latches, made of both plastics and metals, are variable and useful components that can be implemented in a number of different applications. Draw Latches Draw latches, also known as tension or toggle latches, are made to forcibly pull surfaces together and secure them.